Both are Democrats with a steady history of politics and activism in New York. Both graduated from in-state universities and began their careers by working with labor unions. Both are people of color and have participated in the political arena while being the only one of their demographic in the room. On virtually every policy issue, they agree, yet the two -- Marisol Alcántara and Robert Jackson -- are engaged in a nasty political race that will be decided on primary election day, September 13. Alcántara is the first-term state senator of District 31, a western sliver of Manhattan that covers parts of Midtown West and the Upper West Side before widening into neighborhoods like Washington Heights and Inwood. She’s currently the only Latina elected to the New York State Senate, the 63-seat upper house of the state Legislature where the Republican conference recently held a one-seat majority, bolstered for the last seven years by the Independent Democratic Conference, a breakaway faction of elected Democrats that Alcántara joined after her election two years ago. The IDC, which folded in April of this year under immense pressure to rejoin the larger mainline Democratic conference, invested heavily in Alcántara’s first campaign, providing her with hundreds of thousands of dollars in funding as she narrowly won a four-way primary guaranteeing her ascension to the Senate given the district’s overwhelming Democratic enrollment. Democratic Governor Andrew Cuomo, himself seeking a third term this year and facing a tough primary challenge from Cynthia Nixon, brokered the IDC reunification deal just after this year’s state budget was decided, attempting to undercut a central line of criticism he’s received: that he supported the existence of the IDC to help bolster Republican control of the Senate and govern more from the center than the left. The deal made Senator Jeff Klein, leader of the IDC, deputy leader of the Democratic conference, behind Minority Leader Andrea Stewart-Cousins, who could become the first woman of color to lead the Senate majority if Democrats take control of the chamber through this year’s elections. Despite these efforts to sew the intra-party split shut, all eight former IDC members face spirited primary challenges, with Alcántara widely seen as the most vulnerable to defeat given her limited tenure, the closeness of her 2016 victory, the increase in IDC awareness and anti-IDC activism, Jackson’s history in the district, the one-on-one nature of the race, and other factors. Jackson – a former Community School Board President in the 1990s and the only Muslim City Council Member during his 12-year tenure – is running for the seat for the third straight eletion, having lost to former senator, now U.S. Representative Adriano Espaillat in 2014 and Alcántara is 2016 (he also ran unsuccessfully for Manhattan borough president in 2013 as he was term-limited out of the Council). While last time around Jackson warned of Alcántara’s ties to the IDC, this time he is using her membership in the conference against her as he tries to unseat her, while she touts bills she has been able to pass and funding for the district she has been able to secure as the results of that IDC membership. When Espaillat left the New York State Senate in 2016 to join Congress, Alcántara made her bid for the newly empty Senate District 31 seat, as did Jackson and fellow Democrats Micah Lasher and Luis Tejada. Alcántara won the primary, with 8,309 votes, and Lasher and Jackson trailed closely behind, at 7,737 and 7,616, respectively. Tejada received 1,253 votes. Lasher is not running this year and has instead thrown his support behind Jackson. Tejada is not running either. While she was overlooked for support by most Democratic officials and clubs, labor unions, and others, Alcántara found support from the IDC, receiving hundreds of thousands of dollars and political support from the group, which was looking to grow its ranks. She reportedly did not publicly commit herself to the breakaway coalition during the campaign, but, on the night of her victory, Alcántara’s spokesperson announced that she would be joining its ranks in Albany. It is Alcántara’s IDC membership that is the core of Jackson’s challenge. Alcántara defended the dissolved coalition, arguing that the IDC’s existence did not change the fact that Democrats would still not have held a majority in the Senate, but also that her values and the policies she stood for were not put in peril by her membership. “Marriage equality was done with a coalition government. Raise the Age was done with a coalition government. Paid family leave was done with a coalition government. A lot of free college tuition was done with a coalition government, also,” she said of policies that have been passed through a Republican-IDC led state Senate over the past several years. Both candidates espouse similar policy issues as the pillars for their senatorial campaigns. If reelected, Alcántara has a Ten Point Action Plan that deals with issues ranging from immigrant protections to gun control. Likewise, Jackson’s platform, according to his campaign website, devotes attention to nine separate issues, spanning his views on topics like education and the environment. The candidates’ policy positions show a lot of overlap, and they cite similar legislation they want to see passed through Albany next year, though they do prioritize some different bills. At the top of Alcántara’s agenda is the issue of immigrant rights, namely the Dream Act, a bill she co-sponsors that would allow undocumented immigrants and their children access to state financial aid for college, as well as a farmworkers’ rights bill; meanwhile, Jackson’s campaign has been less outspoken on immigrant rights and his campaign website makes no mention of the Dream Act, which has not passed the Senate along with many other top Democratic priorities, a fact Jackson linked to his opponent and the IDC, while Alcántara blamed a Republican Senate majority. “When you look at what has occurred in the tenure since the IDC, Marisol Alcántara included as one of those, nothing has been passed as far as legislation that benefits the people I represent,” Jackson said on Max & Murphy. Along with the Dream Act, Jackson mentioned bills dealing with rent control, health care, and women’s reproductive rights, all of which are listed in both Alcántara’s and Jackson’s platforms. He’s consistently had education funding at the top of his agenda over decades and believes that New York City schools are owed billions more from the state as a result of the Campaign for Fiscal Equity lawsuit. Alcántara highlights her own accomplishments, especially related to Latinas. During her two year tenure in the state Senate, Alcántara says she has secured over $7 million in state funding to her district, using these resources to develop community-based organizations such as Upper Manhattan’s first LGBTQ Youth Homeless Center and the establishment of the Immigrant Defense Fund, which provides free legal services to documented and undocumented immigrants. She has also invested $500,000 into implementing a pilot program that works to reduce class sizes for English language learning students -- “Such as myself,” Alcántara, who moved to the United States at age 12 from the Dominican Republic, added on Max & Murphy -- and has worked to address issues on the Senate floor that have traditionally not been spotlighted. Jackson has said that Alcántara only focuses on the northern part of the district, where she got the bulk of her votes in 2016 and which is heavily Latino. She has staked some of her argument for reelection on the fact that she is the only Latina in the Senate, while Jackson dismissed any concern with unseating her and removing a woman and the lone Latina senator from office, saying that demographic qualities don’t supercede making the right, or wrong, choices while in office. Still, the two agree on much policy -- the senator and her challenger have both announced their support for two key pieces of legislation in regards to reproductive rights, the Comprehensive Contraceptive Coverage Act and the Reproductive Health Act, which would, respectively, mandate insurance coverage for contraceptive options and uphold a woman’s right to choose contraception or an abortion. Both Alcántara and Jackson support the passage of the New York Health Act, another bill that Alcántara co-sponsors, which would establish universal health coverage to New Yorkers statewide. Affordable housing and voting reform are other key issues across this year’s races, including in the Alcántara-Jackson contest. For the former, both candidates have campaigned on the promise to repeal vacancy decontrol and set an end to vacancy bonuses. For the latter, both support the establishment of early voting, no-excuse absentee ballots, and same day voter registration. Additionally, Alcántara and Jackson support the establishment of a public campaign financing program and closure of the Limited Liability Companies loophole, which allows entities to donate virtually limitless sums to candidates by using various LLCs. Alcántara and her former IDC mates find themselves in controversy given that a state Supreme Court ruled as illegal a campaign financing deal struck between the IDC and the Independence Party – which allowed the IDC and Senator Klein as its leader to raise its own funds despite not being a political party and to funnel unlimited amounts to its candidates. Critics and constituents alike have called for Alcántara and other former IDC members to return the money raised through the account, but thus far it appears that the parties involved met the only court-mandated requirement involving details of how the account is registered. Former IDC members have said they have no intention of returning the money, though the State Board of Elections Enforcement Counsel, Risa Sugarman, has said they should. The issue has become a major point of attack from Jackson and other IDC challengers. 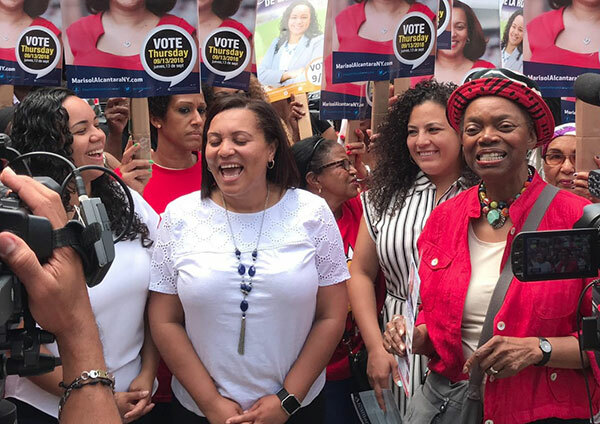 January to July, Alcántara raised $116,000 for her reelection campaign, falling short of her $130,000 expenditures it that time, according to July campaign finance filings. Additionally, she received about $66,000 from the IDC committee in question, and had about $132,000 cash on hand at the filing. Jackson has claimed 8,800 campaign donations, with an average contribution of $31, according to his campaign office, which pointed out that Alcántara had received only 503 donations. Jackson raised a little more than $156,00 in the most recent six-month filing period, and had raised a total of $284,490 for this race as of mid-July. At that filing, he had about $158,000 on hand to spend. A string of city and state figures have endorsed Jackson to be the next State Senator of the 31st District. These figures include the New York City Comptroller Scott Stringer, City Council Speaker Corey Johnson, former Manhattan Borough President Ruth Messinger, gubernatorial candidate Cynthia Nixon, and various others. Organizations such as the Working Families Party, No IDC NY and Tenants PAC have also thrown their support behind Jackson. Additionally, while Jackson holds the endorsements of 15 Democratic clubs within the district – all of District 31’s Democratic clubs save for the Northern Manhattan Democrats for Change – Alcántara lacks the endorsement of any of the district’s clubs, according to the Jackson campaign and a review of Alcántara’s endorsement list. Alcántara, meanwhile, currently holds the endorsement of Senate Minority Leader Stewart-Cousins, City Council Member Ydanis Rodriguez, Senators Roxanne Persaud and Velmanette Montgomery, as well as of a wide variety of labor unions, such as the Uniformed Firefighters Association, the Transport Workers Union Local 100, the New York State Nurses Association and Uniformed EMTs. She also has the tacit support of Gov. Cuomo, who said when announcing the Democratic Senate unity deal that the parties involved would not support primaries against any of the others involved. After 46 years and 23 terms, voters in the 13th Congressional District in Harlem have chosen someone other than Rep. Charles Rangel to represent them. The retiring 86-year-old, a legendary figure in Harlem’s political scene, appeared to want to extend his legacy by keeping the seat he had held for decades in the hands of an experienced politician of his choosing, but changing community demographics, a 2012 redistricting, and a crowded 2016 Democratic primary field seem to have thwarted his efforts. State Senator Adriano Espaillat, who lost to Rangel in the 2012 and 2014 Democratic primaries, appears to have edged out a 1,200-vote win over his closest challenger and Rangel’s prefered successor, Assemblymember Keith Wright. After initially refusing to concede, calling for every vote to be counted, and demanding a federal investigation into voter suppression, Wright declared Espaillat the winner on Thursday. 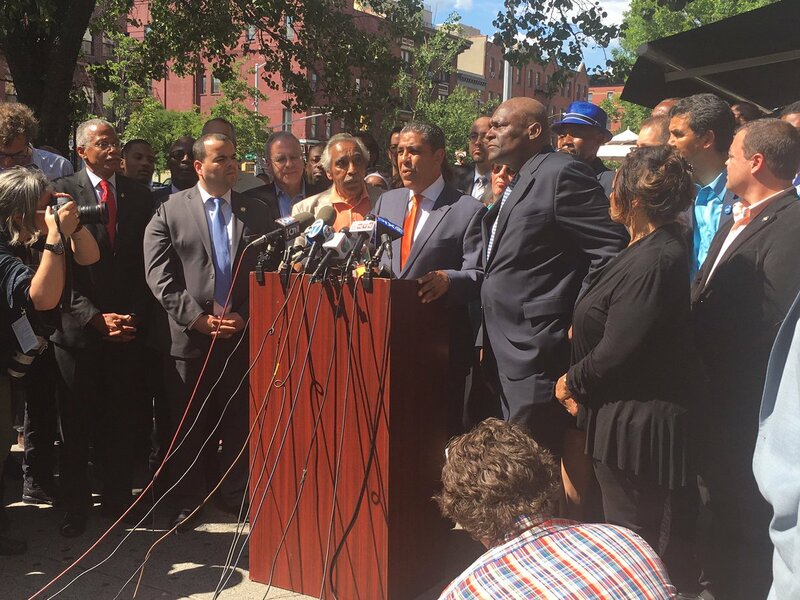 Rangel, Espaillat, and Wright held a unity meeting and press conference, with Espaillat saying he expected to have Rangel as a mentor. Espaillat would be the first Dominican and the first formerly undocumented member of Congress. His win gives a boon to Hispanic political power, in New York City and elsewhere, while also showing a decline the strength of black political power in Harlem and nearby. In this heavily Democratic district, the winner of the party primary is a lock to win the November general. The outcome has other implications, too, especially around the state Legislature, with a game of musical chairs appearing to commence. While every vote in the NY-13 race is indeed counted, Espaillat’s apparent congressional victory lends clarity to the race for his state Senate seat and raises questions about Wright’s political future. Wright, who chairs the powerful Assembly housing committee, pledged in early June not to seek reelection to his Assembly seat should he lose and challenged Espaillat to promise not to run for his Senate seat should his bid fall short. Espaillat’s camp dismissed the pledge as “desperate.” State legislative primaries are in September. Contenders have lined up for both seats. Micah Lasher, a former chief of staff to Attorney General Eric Schneiderman, launched a campaign last month with the caveat that he would drop out if Espaillat lost his congressional bid and sought reelection to the Senate. With Espaillat’s victory Lasher now seems locked in for a primary battle against former City Council Member Robert Jackson, who challenged Espaillat in 2014. Jackson endorsed Wright in the congressional primary and attended Thursday’s press conference. So far that race has featured Jackson attacking Lasher for his previous work for education reform group StudentsFirstNY, a pro-charter school group that has campaigned against Senate Democrats. Lasher’s camp has in turn pointed out that Lasher has personally supported Democratic candidates. Lasher has been consolidating support among many elected Democrats, though the race will gain even more clarity now that Espaillat's future is clear. Less clear is the future of Wright’s Assembly seat. Wright endorsed City Council Member Inez Dickens to replace him (she was also at Thursday’s press conference), but with his loss many Harlem insiders wonder if Wright could renege on his promise. Wright may decide, though, to run for the Council seat Dickens is said to be leaving. There is plenty of chatter about Wright positioning himself to challenge Espaillat in two years, especially if he can work to ensure that there are fewer other black candidates in the running. On Wednesday, Wright’s campaign invited reporters to an event featuring Wright and Rev. Al Sharpton, who had held a fiery rally condemning Wright’s opponents last weekend. Wright didn’t appear at the event and Sharpton struck a conciliatory tone, asking the district to come together to support Espaillat - which is what happened on Thursday. “We need to have a climate of coming together, and not of acrimony and rancor that pits communities against communities inside the district,” Sharpton told reporters. Espaillat’s statement on Wednesday echoed Sharpton’s pleas for unity. “To those who voted for one of my worthy opponents - I pledge to work my heart out to represent you, knowing that our district is not a Latino or black or Asian district. 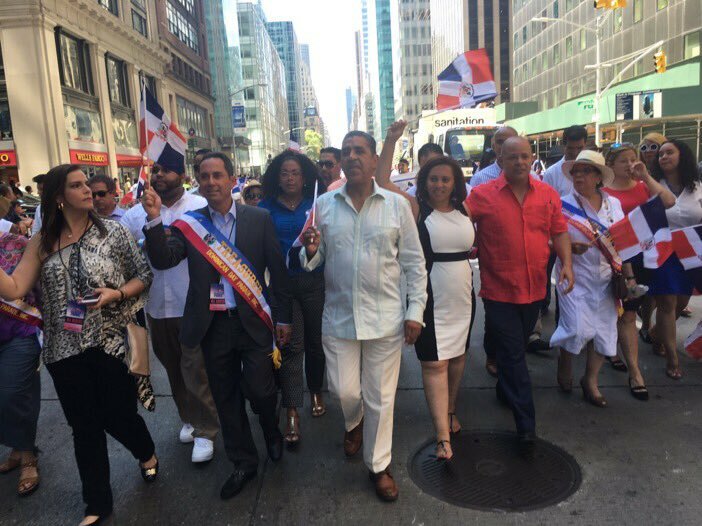 It's a district that belongs to all of us, and we simply cannot succeed unless all of us are moving forward together," Espaillat said. What Wright does about his Assembly seat is the next shoe to drop as the Lasher-Jackson Senate race heats up. Dickens was an active supporter of Wright’s congressional campaign and appears keen to move to the Assembly. She will be term-limited out of the Council at the end of 2017. There are no term limits for state legislators, Wright has served in the Assembly since 1992. Neither Wright’s nor Dickens’ representatives responded to requests for comment for this story. The practice of trading City Council and state legislative seats is fairly common and easily achievable due to the facts that almost all races in New York City are decided during the Democratic primary and city and state elections do not occur in the same years. Current Council Member Inez Barron ran for her husband Charles Barron’s Council seat after he was term-limited out of office - he then successfully ran for her Assembly seat the following year. The practice has an extremely high success rate because the Democratic County Committees have major sway in who runs and gets political and financial backing. Wright is the head of the Manhattan Democrats and would likely be able to maneuver himself into an easily winnable race should he choose to do so. If he does indeed decline to seek re-election, his replacement will be chosen in September’s primary (agian, by virtue of the fact that there is virtually no Republican presence in Upper Manhattan). If Dickens were to win the seat, she would leave the Council and Wright could then run in the special election to replace her.